Britain’s Brad Anderson (Verde Substance KTM) backed up yesterday’s EMX300 race win with a second place this morning to claim the overall victory at the MXGP of GB at Matterley Basin. Anderson, the defending champion, completed the opening lap in sixth and then set about climbing the leaderboard before slotting into second on lap seven. He chased Andero Lusbo (Husqvarna) for the remaining four laps but, with the Estonian fifth yesterday, the aggressive North Easterner – who was nursing an injured knee – knew he didn’t need to make a pass to top the podium and he came home just over three seconds adrift. “I didn’t get the best of starts today,” he said, “and this place is so hard to pass on because they graded it all. I just had to dig deep and try to forget about my knee but in the left-hand corners I couldn’t put my leg out. 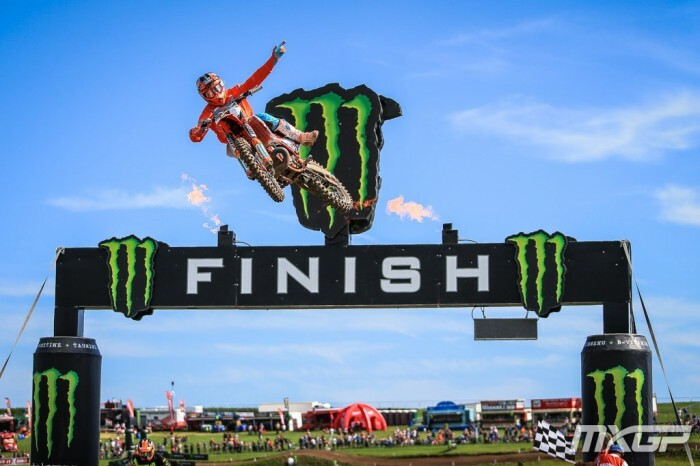 The result – his second overall win in a row – moves Anderson into a 26-point lead after Dutchman Mike Kras (GL12 Racing KTM), who had led the championship after the first three rounds, DNF’d both races. Czech rider Vaclav Kovar (Gas Gas) backed up yesterday’s second-placed finish with a third this morning for second overall, one point ahead of Lusbo who finished fifth on Saturday. Out of the other British riders in action this weekend, Ash Wilde (RMJ Husqvarna UK) was next-best in fourth overall with three-five finishes. Ben Putnam (Yamaha) was seventh from a seven-eight card, one place above wild Welshman Ashley Greedy (KTM) who carded nine-seven.